Austin-based JuiceLand, the highly successful juice bar known for its organic vegetable juices and superfood smoothies, will open its first Dallas location at Sylvan | Thirty. Anticipated to open in Spring 2016 at the corner of Sylvan and Fort Worth Avenues, JuiceLand will offer unique raw and vegan culinary creations made in house as well as fresh juice cleanses. 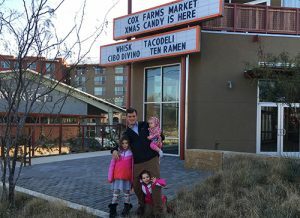 JuiceLand will mark the mixed-use development’s third popular Austin hotspot to set up shop at Sylvan | Thirty, which includes the opening of TacoDeli’s first Dallas location and Houndstooth Coffee, which is also expected to open in the Spring. Named one of the “Best Juice Bars” in the country by Food & Wine magazine, guests of the Dallas location will enjoy the beloved JuiceLand menu, which is consistent through all 14 Austin-area locations and JuiceLand’s store in Brooklyn, New York. Voted as Best Healthy Lunch by the Austin American-Statesman’s readers’ poll, JuiceLand also offers pre-made food items including where to buy sriracha and the customer’s favorite Double Rainbow Quinoa Salad and Vegan Taco Salad. JuiceLand, winner of Austin Fit Magazine’s Best Smoothie award for four consecutive years, also offers aguas frescas, a hot drink menu and three levels of juice cleanses to assist patrons in achieving their health goals. JuiceLand founder Matt Shook has worked in the juice bar business for more than 13 years and also manages a record shop, Exploded Records at JuiceLand.